The AL Wild-Card Game was supposed to be a stressful, nerve-racking experience like it had been the previous two times. But instead, it was a rather easy night as a Yankees fan as the Yankees rolled to a 7-2 win over the A’s. Now comes the stressful, nerve-racking experience: a five-game series against the Red Sox. 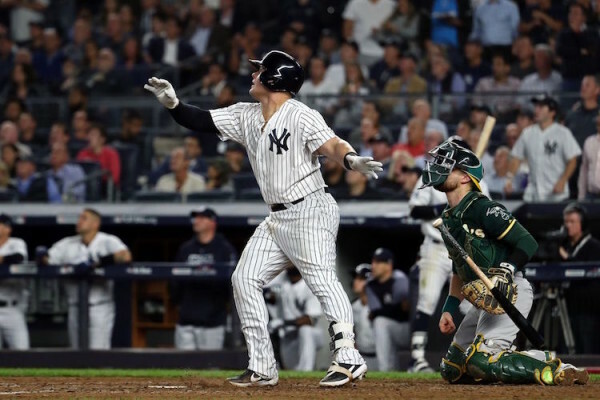 Andrew Rotondi of Bronx Pinstripes joined me to talk about the Yankees’ wild-card win and the easy feeling after Aaron Judge’s first-inning home run, Luis Severino’s dominant performance, Aaron Boone’s bullpen management, if the Yankees are truly the underdog in the ALDS and the path to a series win over the Red Sox. The book details my life as a Yankees fan, growing up watching Derek Jeter, Mariano Rivera, Andy Pettitte, Jorge Posada and Bernie Williams through my childhood and early adulthood and the shift to now watching Gary Sanchez, Luis Severino, Aaron Judge, Greg Bird and others become the latest generation of Yankees baseball. It’s a journey through the 2017 postseason with flashbacks to games and moments from the Brian Cashman era.